The incredibly sad feeling you have before hitting a pothole. Just think of it. You cringe when you see it, try to move away from it, and suddenly the loud thump of the wheel suggest that you may have to take your car to the shop. More than anything, a business needs to keep their clients happy. Your clients are happy when they do not sink into potholes. Avoid Damage claims or unnecessary problems with your cars and your customer’s property. Potholes increase the chance of any wheel and tire problems from the constant thump and bump, vehicle suspension damage, scratches, dents, and leaks. 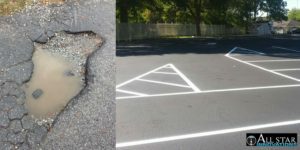 When trying to move away from a pothole to save your car from damage, you may end up turning rather quickly, and lately notice a car coming the other way. Once potholes are covered, traffic is much easier to flow from one point to the other. Your clients like to have a nice place to drive into. Just as if you want them to come back, they also like to have a nice place to come back to, it is part of customer service. Maintaining your roads and parking lot lets your clients know that you care. Let us help you solve your pothole problems! At All Star Innovations, we are happy to offer our expertise at a fair and reasonable price. Call us today for a free quote. Call 678-257-4004 and Follow us on Facebook to check out our projects and updates!